Up and down | carpe diem! Do you remember the strange, mis-shapen ashtrays I used to bring home from the summer ceramics kids classes? The vases that only held water and flowers if they were braced upright with plasticine? Well, this is the fibre equivalent of one of those ashtrays. It’s the Wool Peddler Shawl from Folk Shawls, handknit by me from my very own, very first handspun yarn project, a blend of alpaca and silk. I confess I am quite proud of it; I’ve been told it’s very good for a first yarn. The silk shines in the autumn sunlight and the alpaca is already developing a fine halo to trap the warmth. While down on my hands and knees to pull guard hairs from the blocking shawl, I spotted some additional content. There’s cat hair of course (what do you expect from this household? ), and I’m sure I found some of mine and some of his, too. So we’re all here, holding you and keeping you warm on cold winter nights. I’ve learned a lot from spinning and knitting this shawl, more than I’d have thought possible when I began it. The improvement in yarn quality is quite literally palpable: I just wish that I’d thought to BEGIN the shawl so my earliest effort was hidden in forgiving garter stitch, instead of resorting to it at the end where the stockinette lace is less forgiving. I spun this painfully, boring-ly slowly: I started within a fortnight of acquiring my wheel at the beginning of March, and I didn’t finish the 600m of 2-ply until the end of June. I think it’s [up] reasonably consistent in weight and fineness because I refused to try to push for more speed. [down] There’s some inconsistency in the grist, which shows in the way the stitches move. But I went from [up] loving the roving to [down] really disliking some of the singles to [up] liking the 2-ply and loving the garter stitch bit… until I discovered how the convoluted track of knitted yarn pushes any stiff material ([down] the cursed guard hairs) up and out of the fabric. I have actually spent 5 HOURS working over that shawl with tweezers, pulling out guard hairs. 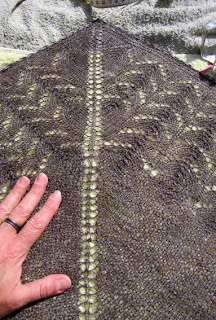 The top of the shawl that will sit on the neck is soft and hair-free, but the lace where the extra twists hold the hairs is still a bit prickly. I. Must. Assess. Roving. More. Carefully. * But the shawl is still beautiful and I am still proud of my accomplishment. Yes, some of you have seen some of that before. 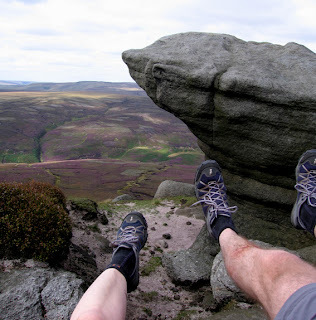 It’s Kinder Scout again, a fortnight ago. Isn’t the heather lovely? Imagine entire hillsides and hilltops covered in those colours, blending heather-purples and greens and browns and golds. The patchwork of fields is the Edale valley, with a train that reminds him of a sequence in Spirited Away. We’ve walked that long ridge (Lose Hill to Mam Tor) beyond the valley, there and back again; this time the plan was to walk around the Kinder plateau. Sadly the long drive means a late-ish start, made 30 minutes later because we lost the will to walk when we smelt frying bacon. Two bacon&egg buns later we began at a cracking pace; not deigning to follow the path, we shot straight up a clough (water-cut steep ravine) and onto the path. We were going quite well, even with regular stops in hope of preventing his knee problems when he slipped and fell, scraping his shin very badly indeed. Nobly insisting it didn’t hurt (once the agony of the disinfectant had ebbed), we continued a bit more slowly. The blood trickling down his leg sparked several comments from other walkers; apparently someone walking ahead of us had a similar but far worse injury. By about 1500 we were on the northern edge with a stunning view. Glossop and the outskirts of Manchester were faintly visible in the haze (but not in that image). The sore bits. You can just see the blood on his shin. My foot rates mention because I’ve discovered that the swollen joint of my big toe is arthritic, with restricted motion (hallux limitus) and it’s occasionally aches deep in the joint on hard walks like these. I’ve started investigating treatments. Here we both found a generous serving of gorp most efficacious. 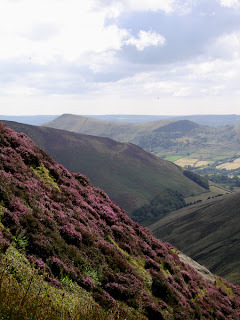 Look at the heather on those hills! Sadly, as we marched on we realised that if we did the full circuit we’d be as late down the hill as we were up it and home much, much later after the long motorway drive. So we bailed onto the footpath over the top and made our way back to Edale. This doesn’t bother him much, but I’m a completist [not so much for music, but very definitely for SF authors. And possibly walks, it seems]. Not doing the entire circuit is niggling at me like a, a hangnail. I have to do it right, I have to FINISH IT even if it means getting up at 4am! Next, more knitting. I have some yarn… OK, I have quite a lot of yarn, but I have some yarn in my hands for the Next Project: the Cinnabar Pullover from IK Fall 2007. It may not have a v-neck (it’s for the winter!) but it does have waist shaping. I’m working on the courage to add some short-rows for the bust; I may have to, as I’m seriously considering the 37″ and I’m a 38. I must check the hip widths and I know I must recalculate the stitch counts for a different gauge. I’m going to knit this to fit. And I’ll finish it. * The person who knows alpaca fibre has just seen it and says it’s not bad for guard hair. Really. She showed me some commercially available alpaca roving that is just stiff with them. Absolutely horrid stuff. This entry was posted in Uncategorized on September 4, 2007 by sarahw. Shawl is absolutely stunning. Wowee. Mountain climbing is also pretty impressive. Whew!A word about Cinnabar..I was sorely tempted, but the high neck and collar there are not likely to be flattering to those of us with buxom parts. I recently looked at this in “What Not to Wear” and was reminded of how unflattering this might be. Why not knit the sweater and skip the collar and button bits? Knit it into a (high) V-neck instead? Just a thought from another buxomy person who dreads short-rows. Your Mom’s birthday shawl is loads better than a well-meaning but misshapen ashtray. It is quite beautiful and you are right to be proud of your efforts!Mmm. Bacon biscuits and heather-covered mountain passes both sound dangerously delightful. Your Mom’s birthday shawl is lovely!!! and all from your very own, very first handspun yarn. its really something. I aim for something like this in a few years! The birthday shawl is lovely and one to be proud of, I’m sure your Mother will appreciate the significance of it just as she did with the vases. So far I have two alpaca rovings in my stash and both seem to be how you have described yours, you have been far braver than I as I chickened out after the first sample. One day! I can almost imagine the wind blowing all my cobwebs away when standing on one of those mountains, simply beautiful. Hope His leg is healing, a good excuse for a stiff drink! Well done you! Your Mum’s shawl is fantastic. I think the folk shawl is a super pattern & I am in awe of any spinning! Lovely pictures of the Peaks.